Basket Size - 30" X 48" / Basket Capacity - 500 lbs. Weight - 4,440 lbs. / Tongue Weight - 200 lbs. Length Stowed - 21' 11"
Width Stowed - 5' 6"
Height Stowed - 6' 5"
Leveling Capability - NO MORE than 12.5 Deg. Great for tree trimming, power washing, Christmas tree lights, etc. Must use 2" ball on receiver style hitch to tow. Full size vehicle ONLY for towing. 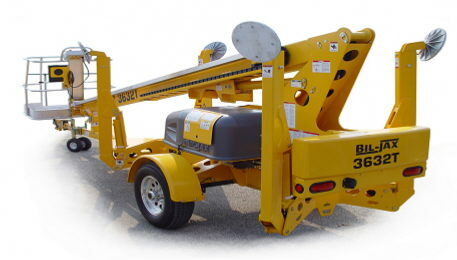 Lift must be unhooked from towing vehicle before setting up and using. * Please call us for any questions on our lift tow beh. 42 foot self leveling rentals in Hagerstown MD, Williamsport MD, Martinsburg WV, Waynesboro PA, Mercersburg PA metro areas.